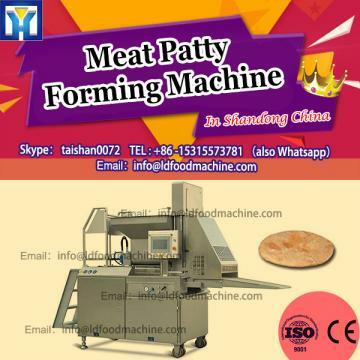 Fully Automatic Hamburger Forming machinery can automatically complete filling, Patty forming, stickers, such as the output process. Can produce market popular burger, McNuggets chicken nuggets, a fish burger patties, potato, pumpkin pie, series of products such as meat, is an ideal fast food restaurant, distribution centers, food factory ideal meat (vegetable) molding equipment. Forming shape can be customized. It can be connected with battering machinery, breading machinery or fried machinery. Thickness can be adjustable easily from 6-18mm. Easy operation, only need put material in silo, then products can be out in good form. Products forming changing is very easy by changing mould. The whole machinery is made of 304 stainless steel material and other material used for food, conform to the Liene standards, in accordance with LDstandard, easy to clean.